The Whip Archives - Write for Wine: It's Wine O'Clock Somewhere!Write for Wine: It's Wine O'Clock Somewhere! Two years ago, we wrote about how we enjoyed Murrieta’s Well 2011 The Spur from Livermore Valley ($25). We just tasted the 2013 vintage, and we liked it even more. 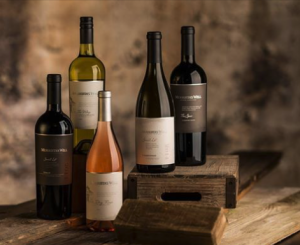 While the price has increased to $30, so have the flavors, with a higher percentage of Petite Sirah and Cabernet Franc, and the addition of Merlot this year. Crafted by the new director of winemaking, Robbie Meyer, this unique red wine blends 40% Petite Sirah, 26% Cabernet Sauvignon,10% Petit Verdot, 8% Merlot, 8% Malbec and 8% Cabernet Franc. In other words, the Petite Sirah forms a beautiful foundation for the classic Bordeaux varietals. We think this big blend would pair well with roasted or grilled meats, dishes with red sauces or rich cheese. Thanks to Murrieta’s Well for sending us a sample of The Spur, as well as 2014 The Whip, a white wine blend also from the Livermore Valley. While white blends aren’t our favorites, we know many people who would enjoy The Whip ($24). Murrieta’s Well is one of California’s original wineries, propagated in 1883 with vineyard cuttings from Chateau Margaux and Chateau d’Yquem in France. Need we say more? Oh, one more thing — Murrieta’s Well is owned by Philip Wente of Wente Vineyards, the country’s oldest, continuously operated family-owned winery.